Rating: 3 Palms - ResortQuest's own rating system signifies first class accommodations - good location - some services and amenities. Renovated affordable condominium resort. The ResortQuest Pacific Monarch is a newly renovated condominium resort that is a great choice for active travelers on a budget. 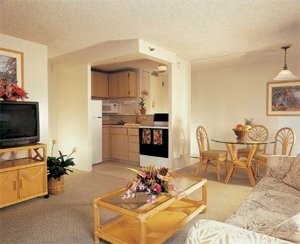 Located less than two blocks from Waikiki Beach the Pacific Monarch is surrounded by shopping - restaurants - and nightlife.All accommodation is spacious and recently redecorated. Junior suites offer kitchenette facilities while our one-bedrooom suites feature complete kitchens. Floor-to-ceiling glass doors dramatically open one entire wall to the tropical trade winds and the excitement of Waikiki. Daily maid service - of course - is provided.The only rooftop swimming pool in Waikiki affords spectacular views of Waikiki. Guests can also enjoy the nearby sauna - jet spa - and hospitality lounge. Our activities desk can arrange golf and tennis - sunset cruises - island tours - and a *zillion* other things. *** HAWAII*S NON-SMOKING LAW ***In the interest of the good health of all our guests,employees and owners, and in compliance with the StateLaw Act 295, ALL ResortQuest Hawaii hotels and condominiumunits managed by ResortQuest Hawaii are now designatedas Non-Smoking Accommodations effective immediately. Junior suite features sitting area with queen sofabed and lanai. Sleeping area offers one queen bed or two twin beds. Wet bar with microwave - two burner stove - coffee maker - mini refrigerator - cookware and dishes. The living area has a dining table with 4 chairs. Approx. 360sf. Large suite offers wrap-around lanai ready for outdoor dining with table and 4 chairs. Indoors the living room has a queen sofabed as well as an eating area with a table and 4 chairs. The bedroom has one queen or two twin beds. The kitchen is fully equipped with refrigerator - stove - coffee maker - microwave - cookware and dishes. Approx. 443sf. From the airport, exit terminal and access H-1 Freeway East, exit freeway via Nimitz Hwy and follow Waikiki directional signs, Nimitz Hwy transitions to Ala Moana Blvd, midpoint on your drive as you pass the Port of Honolulu on your right and the Honolulu business district on your left, Ala Moana Blvd merges with Kalakaua Ave at the Southwest entrance to Waikiki. Proceed onto Kalakaua Ave, stay in the far left lane which becomes Kuhio Ave and the hotel will be on the right at the corner of Kuhio and Uluniu Street. The hotel address is 2427 Kuhio Ave.
All junior suites have kitchenettes with mini-refrigerator - 2 burner stove - coffee maker - microwave - cookware and dishes. One bedroom suites have complete kitchens with refrigerator - stove - microwave - rice cooker - china and cookware. Meals may be ordered from *Room Service in Paradise* from 1100-2130 Hours. * Outdoor Pool * Jet Spa * Sauna * Hospitality room lounge located on 33rd floor just below the rooftop swimming pool provides comfortable surroundings for those relaxing or waiting for late flights. One meeting room is available for use, with a capacity of 35 persons.